Home Sports News Liverpool 0-0 Man City: Why were there no fireworks at Anfield? Liverpool and Manchester City’s meeting at Anfield ended in a goalless deadlock that failed to live up to pre-match expectations. Pep Guardiola’s side came closest to breaking the stalemate when Riyad Mahrez missed a penalty five minutes from time – but otherwise it was a cagey contest amid the early season sparring of the title race. So why didn’t the season’s biggest Premier League game, between two sides unbeaten so far, produce the excitement anticipated? This was the Premier League match of the season so far – the meeting between the two teams touted as favourites to be scrapping out it out at the sharp end of the campaign. 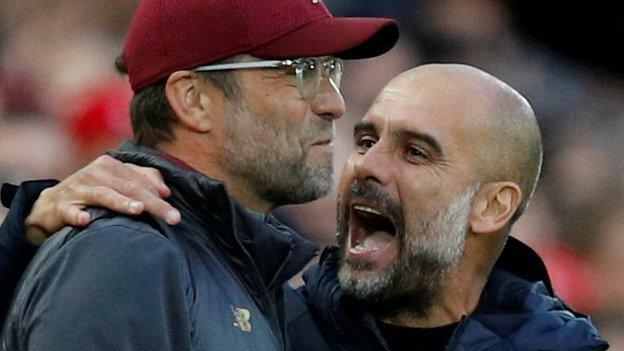 The commitment of Jurgen Klopp and Guardiola to all-out attack was tempered by the respect these two managers and teams have for each other, leading to a game that was low on excitement until the closing stages. This was not the grand spectacle so many expected. Was this, though, really a surprise? When Liverpool beat City in the league at Anfield in January, Guardiola’s side still had a 15-point lead after that game and the title was already becoming a procession. This was a meeting between two unbeaten sides in the early phases of a season where it is already clear that margins for error will be small. It was reflected in the statistics which revealed no Premier League match this season had fewer shots in the first half – only three – level with Newcastle v Arsenal and Huddersfield against Cardiff. The first shot on target came from City’s Mahrez in the 62nd minute, followed by one from Liverpool’s Mo Salah 35 seconds later. Liverpool and City played like two teams unwilling to give ground in the title race and also in the psychological battle in the season ahead. It led to Anfield being shrouded in a cloak of caution. Liverpool manager Klopp said: “In no game we’ve played so far was the level like it was today, even when we won 3-0 at home or 4-3 at home. “When we won 2-1 at City in the Champions League, they pushed us in our 18-yard box and we didn’t know how to come out. Then we had our moments, but over the full match time it was never like that. It meant Anfield did not play host to the full-throttle attacking spectacular so many expected – but maybe it was just neither the time nor the place. Guardiola is the purists’ purist – the manager who will never sacrifice the principles forged at Barcelona and put into further practice at Bayern Munich and now Manchester City. Guardiola proved at Liverpool, however, that he is quite rightly not averse to adding a brushstroke of pragmatism to those principles and was almost rewarded with City’s first Anfield win in 18 games, only for Mahrez’s miss. In City’s historic Premier League title triumph last season, which brought them 100 points, 106 goals and only two defeats as they won by a 19-point margin, Anfield was the place where they were bullied and bruised. City swept Liverpool aside 5-0 at Etihad Stadium but twice in front of The Kop, Liverpool exposed Guardiola’s approach with a 4-3 league win in January that was more emphatic than that narrow scoreline suggests and a 3-0 victory in the Champions League quarter-final first leg in April. Liverpool’s wins were based on two three-goal blitzes in each game – three in nine minutes in the first game and three in 19 minutes in the second – when their intense, pressing style spearheaded by the attacking trio of Roberto Firmino, Sadio Mane and Salah did the damage. City, always committed to all-out attack, were literally over-run in those spells and could not recover. It was a rare blemish on a magnificent season – but this time Guardiola was determined not to let it happen again and prepared his approach accordingly and with a large measure of success that almost brought three points. Put simply – allow Liverpool free run to run at you and even the best teams will struggle. City were still looking for attacking options but this was more conservative and easily the most assured display a Guardiola side has given at Anfield, having also lost to Liverpool on New Year’s Eve 2016. They slowed the game down to draw Liverpool’s sting and silence the usually feverish Anfield crowd, which was quiet for long periods, keeping possession in deep positions. In many ways it was an uncharacteristic City performance but a controlled one which satisfied Guardiola. After a frantic opening phase when they struggled to get out of their own half, City were careful in possession without being over-committed, determined not to fall into the traps Klopp and Liverpool had set for them, and which they fell into, at Anfield last season. City’s tactics were so successful that Liverpool failed to register a single shot on target for the first in the first half of a Premier League game for the first time since November 2017 against Chelsea. Guardiola’s men were also shackled. David Silva had a cross-shot blocked in the 38th minute – a nothing moment but one which saved City from failing to register an attempt in the first half of a Premier League game for the first time since April 2010 against Arsenal. It may not have been the free-flowing City that has carried it all before it – but it was a more nuanced tactical approach designed to avoid the carnage of last season at Anfield and almost resulted in a crucial victory. Liverpool’s over-riding emotions after this draw will be relief at the reprieve handed to them by Mahrez’s wayward penalty and delight that they still remain unbeaten after eight Premier League games, which have included visits to Spurs and Chelsea and a home game with Manchester City. It has also been achieved, barring a couple of occasions, without scaling the exhilarating heights that saw teams blown away by a barrage of goals and attacking football on numerous occasions last season. Klopp can take comfort from a run of four games in all competitions without a win by studying the Premier League table, which has them in third place, only behind City and Chelsea on goal difference. Liverpool’s defence, built around £67m goalkeeper Alisson and £75m central defender Virgil van Dijk, has had much of its vulnerability removed – but the attacking trident that terrorised teams last season is not currently firing on all cylinders. Firmino, Mane and Salah were comfortably subdued by City yesterday. The Brazilian was substituted while his attacking partners were out of sorts. It is perhaps understandable they would struggle to deliver the stellar figures they produced last season and there is still plenty of time for them to punish opponents again, but against City they were nowhere near their best. Last season, the three forwards played 150 games in all competitions scoring a remarkable 91 goals, with Salah getting 44, Firmino 27 and Mane 20. So far this season they have played 24 games in all competitions and scored nine. There is too much talent in these outstanding players not to be a huge influence as the season goes on but Salah cut a frustrated figure while both Firmino and Mane were marginalised by City’s approach. Their time will surely come again – and when it does Liverpool’s title aspirations will carry even greater weight. Next articleWhy do countries want to buy the controversial Russian S-400?